Expert craftsmanship, reliability & professionalism for home interiors, exteriors & businesses. Golden Brush Painting is a professional residential and commercial painting company servicing the greater Pittsburgh area. Golden Brush consistently earns the highest consumer reviews regarding expert craftsmanship, reliability, attention to detail, value, project management and professionalism. As our primary business in Pittsburgh, interior painting is what we do best. Available for every step of the process, from planning and color choices to cleaning up spotlessly after the job is done. Whether you’re thinking about your own comfort or getting ready to sell and looking to improve curb appeal and property value, Golden Brush Painting has the exterior painting services that will create the look that you want. From giant warehouses and sprawling apartment complexes to one-room offices, at Golden Brush Painting we offer a wide range of commercial painting services designed to match your needs perfectly. Cosmetically speaking, nothing changes the feeling of a home more than an interior painting project. Whether it’s just a single den or every room in the house, the difference is immediate and you’ll wonder why you waited so long to renovate. In every detail of every project, Golden Brush Painting is devoted to the utmost professionalism. As a full-service painting company, we use premium products and superior painting techniques so that we can offer you an exclusive “NO EXCLUSIONS” Painting Happiness Guarantee. As our primary business in Pittsburgh, interior painting is what we do best. A new exterior paint job is not all about money – it also adds considerably to your feeling of comfort and enjoyment of your entire home space. Whether it’s a complete package of painting services or just mending a fading fence, the work of our experienced and talented professionals will give you an even more pleasant sense of home. From the outside, your home should be attractive and inviting for your family, your guests, and the neighborhood in general. Whether you’re thinking about your own comfort or getting ready to sell and looking to improve curb appeal and property value, Golden Brush Painting has the exterior painting services that will create the look that you want. As with all of our projects, we use only the most durable and high quality paints that save you money in the long run with their longevity and increased attractiveness. complexes to one-room offices, at Golden Brush Painting we offer a wide range of commercial painting services designed to match your needs perfectly. From railings to roller coasters, hospitals to hotels, Golden Brush Painting has the expertise and equipment to do the job right. We adapt to the unique scheduling and project needs of each client to minimize disruption and maximize results. Safety is #1 when it comes to the public and everyone on the job. 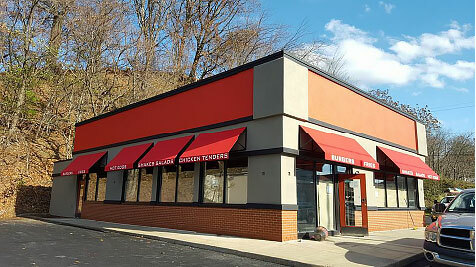 commercial painting projects as easy as small ones – something that few local painting companies can provide. You’ll have an attractive finish that will last for years and send many more new customers coming your way. Our staff are available during off-hours and on weekends. In addition, we can mobilize large teams to finish an important job that lets you get back to doing what you do best – running your business. 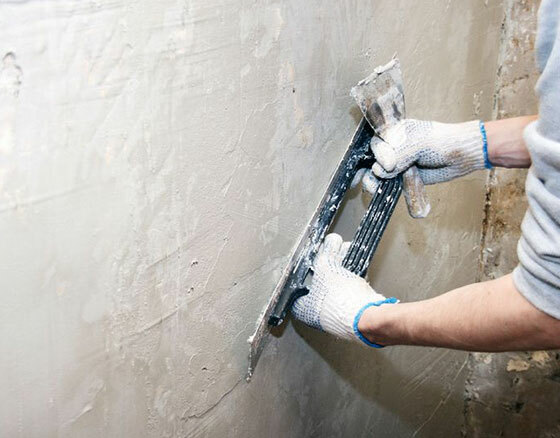 Drywall and plaster repairs can be some of the most frustrating tasks for a homeowner to encounter. Depending on when your house was built, the correct fix could be very different and you may be playing a guessing game trying to do it yourself. Why not let the experts come in and determine the exact solution needed to bring your walls back to their former glory? Outdoor decks and fences are under constant attack from the elements. The sun, rain, changes in seasons and moisture can easily affect your Pittsburgh deck or fence, promoting the graying and general deterioration of the wood over time, if left unprotected. That’s why it is important to both stain and seal your wooden decks and fences to preserve their beauty and longevity. If your deck is showing signs of rotting, warping, cracking, or mildew, contact Golden Brush Painting. Our Pittsburgh wood staining experts will restore your deck to a beautiful finish that lasts. We have years of experience protecting all types of wood and know which stains and sealers are appropriate to use depending on the type of wood being treated. Golden Brush Painting can take care of all your Pittsburgh wood staining needs. Our painters are skilled in all the necessary techniques needed to provide you with a high quality finish for all your wooden surfaces, from fence and deck staining to staining interior wood trim. Our expert crew of wood staining professionals have years of experience and knowledge in providing top quality wood finishes, so you can rest assured that our team will complete your wood staining project to perfection. Contact us today to request service, and receive a free quote for the cost of your Pittsburgh residential or commercial wood staining project. When choosing a painting company in Pittsburgh, it’s true that you have plenty of options, so why would you choose us instead of one of our rivals? Check out some of our previous work and see for yourself. Give us a call at 412-853-7041 to get a free estimate and schedule your next project. We’re also happy to answer any questions you might have about our offered services. We paint all types of projects — interior and exterior residential, commercial, public, and industrial buildings. Our expert painters are dedicated to providing our clients with prompt, professional, quality work. We use only trusted painting materials from the world class brands. Our team follows all necessary manufacturer recommended painting procedures. When choosing a painting company in Pittsburgh, it’s true that you have plenty of options, so why would you choose us instead of one of our rivals? The answer is found in the following three pillars of our service, which we adhere to at all times. Although it should be a given, many painting companies fall short when it comes to professionalism. We know that each and every interaction you have with a painting contractor matters and at the absolute minimum, full and complete professionalism is a necessity and we strive to achieve the utmost professionalism and quality that we feel is an important part of Golden Brush Painting’s service. Being professional means nothing if we don’t have the painting skills to back it up. Fortunately, we do and our team has an impressive combined history of jobs completed. In addition, the core members of Golden Brush Painting are continually improving their talents and skills by studying new developments in the painting industry and applying innovative concepts to their work. Providing proper painting services takes something more than professionalism and expertise – it takes care. Every day, we enter the homes and businesses of our clients for projects. To deliver the right level of care, we take every step necessary to make sure that all items and furniture are protected and that your property is as clean when we leave as it was when we came. We can turn up anywhere in Pittsburgh at short notice and begin working on your job right away. No matter what painting job whether it is for your home or business you can count on us to arrive on time. Give us a call and we’ll be happy to help. When you’re ready to experience a Pittsburgh painting company that displays the right combination of professionalism, expertise, and care, then you know where to find us. Feel free to contact us through phone or email and we’ll work hard to show you that we appreciate your business. Give us a call, we’re always happy to help. Please give us 24 hours to provide you with an estimate. We stand by our craftsmanship and only offer true price quotes. No surprises, great customer service and quick turnaround. © 2019 Golden Brush Painting.